October 11, 2017 – The USC Center on Philanthropy & Public Policy (CPPP) has raised over $1 million for the Irene Hirano Inouye Philanthropic Leadership Fund. 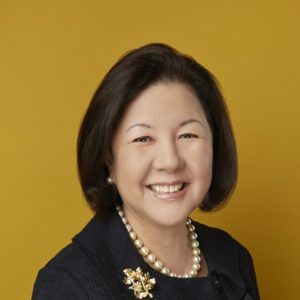 The endowed fund, named in honor of Irene Hirano Inouye, president of the U.S.-Japan Council and former board chair of both The Kresge Foundation and Ford Foundation, focuses on bringing greater attention to issues of shared governance between foundation boards and executives in charting strategic directions for community change. The fund underwrites CPPP’s development of case studies that spotlight the opportunities and challenges that foundation CEOs and boards face in fulfilling their philanthropic missions. This applied research will help foundations stimulate conversations about their respective roles and enable them to provide bold leadership in addressing public problems. The fund was formally launched in March 2017 with a case discussion of Detroit’s Grand Bargain – the catalytic effort of 12 foundations to resolve the city’s bankruptcy and create a pathway to revitalization – with Gerald E. Rosen, U.S. District Judge, Eastern District of Michigan (Ret. ), Rip Rapson, President and CEO, The Kresge Foundation, and Darren Walker, President, Ford Foundation. The accompanying case study, Detroit’s Grand Bargain: Philanthropy as a Catalyst for a Brighter Future, examines how foundations leveraged their dollars, networks and reputations to set the city on a course for a brighter future. “There is a real desire to better understand foundation decision-making, a great deal of which happens at the board level. Yet, other than it being important, we don’t know much about board governance. This fund will be a resource for foundation leaders and executives to learn, improve, and advance their work in helping philanthropy to fulfill its promise,” says Jim Ferris, Center Director and Emery Evans Olson Chair in Nonprofit Entrepreneurship and Public Policy at the Sol Price School of Public Policy. The Price School and CPPP acknowledge The California Endowment, Ford Foundation, Conrad N. Hilton Foundation, The David and Lucile Packard Foundation, Irene Hirano Inouye, The Kresge Foundation, Leonetti/ O’Connell Family Foundation, and the Weingart Foundation for their generous support to establish the Fund. Hirano Inouye received her bachelor’s and master’s degrees in Public Administration from the Sol Price School of Public Policy. In 2013, the school gave her the Global Ambassador Award, which recognizes an individual who best represents the mission and expertise of the Price School in a global setting. She also serves on The Center’s board of advisors. The Center on Philanthropy & Public Policy promotes more effective philanthropy and strengthens the nonprofit sector through research that informs philanthropic decision-making and public policy to advance community problem solving. The Center is a part of the USC Sol Price School of Public Policy, which works to improve the quality of life for people and their communities, here and abroad. Please contact Gregg Millward, Senior Director of Development, The Center on Philanthropy & Public Policy at gmillwar@usc.edu or (213) 740 1776.